Not long ago, major media outlets would post daily articles reporting the price of oil and how demand is far exceeding supply. Not long before that, these same outlets were saying things like "they're not making any more land" as housing prices rose through the roof. A few years before that, the rising stock prices of technology companies were making daily headlines as the stock market had entered what was claimed to be a "new paradigm shift, where traditional methods of valuation no longer apply". Today, it's the price of gold that is the talk of the town. Does this represent an asset bubble? To answer that, we must try to determine the intrinsic value of gold. The intrinsic value of any investment is the sum of the discounted future cash flows the investment will generate. Unlike a bond or a stock, however, there is no future cash flow expected from a bar of gold. In effect, the only reason one would purchase it as an investment is because one believes someone else will be willing to pay even more for it in the future. In his book Margin of Safety, super-investor Seth Klarman argues that this form of investing is not really investing at all, but rather speculating. As the price of any asset rises, speculators enter the market expecting to unload the asset on someone else at a future date at a higher price. While this process can go on for months and even years, with speculators accumulating small profits along the way, eventually a large group of buyers will be left holding the bag when the party is over, with massive losses. There are, of course, industrial and commercial uses for gold. But has the supply/demand dynamic for this metal changed so much in the last few years so as to warrant the large price run-up? Not likely. Therefore, the price has been pushed up by speculators. 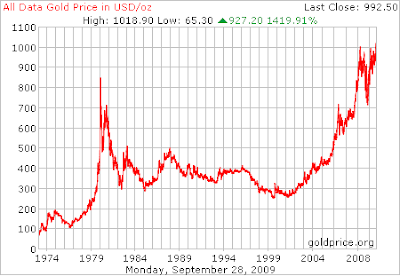 Gold bugs/speculators argue that gold acts as a safe haven when currencies lose value. As central banks around the world add liquidity to stimulate the world economy, currencies should be worth less, they argue. However, due to the fact that the velocity of money has slowed (i.e. money isn't changing hands as quickly as it did during the boom) and capacity utilization is low, inflation numbers are tame despite the large amounts of currency being generated. Therefore, gold is running up on the expectation that the Fed will not be able to control inflation later. Even if one is correct about this (and it is far from a foregone conclusion), how does one quantify what gold is worth under such a scenario? When one buys a security without knowing its underlying value, one is susceptible to large losses. Buying "because the price is going up" is not an acceptable reason to buy for the Intelligent Investor. For value investors, it is wise to avoid falling prey to these psychological frenzies. Investors should stick to buying securities which trade at discounts to their intrinsic values, intrinsic values which can be conservatively estimated. As such, gold is currently not an area where the value investor should foray. Seth Klarman makes an exception for gold and has even owned gold miners in the recent past (couple of years ago)! Gold Miners have cash flow, they could be an investment at the right price, especially if price hedging is in place (thus making cash flow predictable) but just owning gold is not an investment in the Ben Graham sense. I'd be interested in reading more info on that if you have it. You're right, under those circumstances, you are investing. However, those kinds of hedged positions would not interest the current gold speculator, since you don't have upside when the price runs up, but it's great for guys like us since you have the downside protection. Thanks for your post on Gold. I also keep hearing/reading the same that it is in short supply. The mines running full capacity etc etc. You should see Jean-Marie Eveillard on this topic -- a Graham man with a great track record and a history of owning gold. Google for lots of explanations why. I would recommending Peter Bernstein's " Power of Gold - History of a obsession". It gives a fascinating insight on the history of gold and mankind's obsession with it throughout history.It also runs thru gold's evolution as a currency to currencies based on the gold standard. Of course the fact that all major currencies have exited the gold standard it is irrational to look at gold as a asset class. But then a lot of obsessions are irrational.